The European Union should brace itself for a more authoritarian Turkish President Recep Tayyip Erdoğan because the country’s new presidential system is unlike anything else in the Western world. Turkey’s presidential system, narrowly approved in a nationwide referendum last year, should not be confused with either the U.S. or French system, said Selçuk Gültaşlı, former Brussels bureau chief for the now-banned Zaman newspaper. The Council of Europe’s Venice Commission has warned repeatedly that the Turkish system does not envisage any checks or balances, Gültaşlı said in an opinion piece for the EU Observer. “The already strongman of Turkey is now the strongest and no institution (all institutions have been either subdued or tamed since the coup attempt of 2016, which Erdoğan famously called a gift from God) can now challenge his authority,” he said. 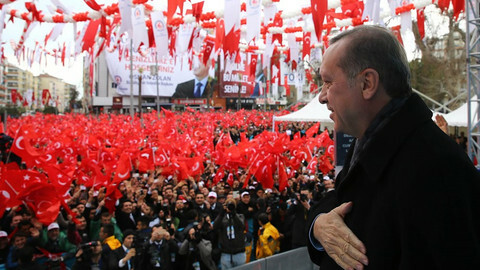 Erdoğan has already vowed a harder approach towards Turkey’s domestic and foreign enemies in a victory speech following his re-election on Sunday. And this time, he takes on board the ultra-right Nationalist Action Party (MHP) – the group will form a coalition with his governing Justice and Development Party (AKP) in a largely rubber-stamping parliament. Newspaper reports already suggest that the MHP will win ministries in the new government, possibly including the interior ministry, which is responsible for domestic security. Zaman was shuttered by presidential decree for being the media arm of the Fethullah Gülen movement, which the Turkish government accuses of masterminding the failed military coup. Gülen, an ageing Islamic preacher resident in Pennsylvania, denies the charges.